"Goodbye Ace, I'll never forget you." I whispered to my black Morgan/Quarter horse. Holding back a sob, I handed the blue lead rope over to a little girl with a bouncy brown ponytail and bold green eyes. "I'll take great care of him!" She exclaimed kissing the horse. I just nodded unable to speak as the girl's father loaded my best friend into the trailer. "Have fun in your new home, Ace! I'll miss you!" I choked as the trailer door shut. I had sold my best friend and now I had to say goodbye. My name is Ashley Strong. I have dark brown hair and brown eyes. That was a year ago. I haven't seen Ace since that day. Every time I think about him, I think back to the reason we had to sell my horse--he was too expensive. I moved from that town eight months ago and I thought that not seeing the old barn would help. It didn't. To be truthful, it only made it worse. The day my life changed was Thursday, July 18th 2016. I was at the barn where I worked and rode cleaning a stall when a horse trailer pulled up the driveway. I set down my pitchfork and headed outside to see who it was. A woman in her late 30's was talking to the barn owner while undoing the door to the back of the trailer. "We must have a new horse," I thought to myself. A loud kick jerked me from my musing. The woman was now leading a black horse, dirty and wild looking from the trailer. The whites of his eyes were showing and his ears were laid back. Now actually paying attention, I noticed what it said on the side of the trailer. "Silver Creek horse and pony rescue." "Ashley, can you take him to the empty paddock?" The owner, Lisa Simmons asked. "Sure." I said and started towards the beautiful animal. He jerked his head in my direction suddenly calming under my touch. "Hey there, handsome boy. I'm going to take you to that paddock and get you something to eat. How does that sound?" I led him slowly towards the paddock next to the barn. I went inside and unclipped the halter. The horse trotted a few feet away but then stopped watching me as I closed the gate. "I'll be back with some food alright?" 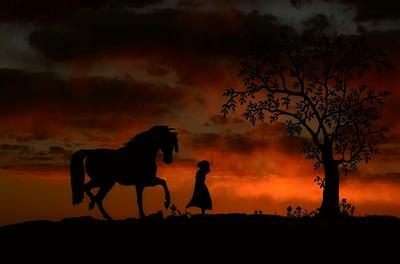 "Here you are," I told the horse placing a bucket of corn on the ground. I also brought an extra grooming kit. "You could use a good cleaning. That is if you let me." He slowly investigated the corn while watching me the whole time. A couple minutes later, he began eating. "Good boy," I whispered. "Just make sure you don't bolt your feed." Once the bucket was empty he began nosing it over, looking for more. "Sorry," I told the horse and slowly extending my hand for him to smell. "You're not as wild as they say, huh? You remind me of my old horse." I whispered stroking his neck. "Now, how about getting you cleaned up?" I picked out a curry comb and held it up for him to see and smell. He jerked his head up and trotted over to the other side of the paddock, the whites of his dark brown eyes showing. "Whoa... It's okay boy," I said softly. "We won't do this right now, I guess." I took the grooming kit and headed out of the paddock. "I have to go now," I say quietly as my Mom pulls up in her car. "I'll see you tomorrow." With a wave, I head up to the barn. "Good morning, boy!" I sang as I headed from the car and straight to his paddock. He lifted his head from a pile of hay Julia must have given to him. "I think we need to find a name for you. How about Ace? That was my horse's name. You look kind of like him besides the dirt and wildness. You don't have a little white sock like he did but I can still call you that." The horse stood watching me. I grinned and sat on the fence watching him. "I haven't been this happy in over a year," I thought to myself. "How about you try and groom him today?" I looked to my left to see Julia standing there watching Ace. "I'm calling him Ace for now, is that alright?" "Sure." Julia nodded watching me. "That was the name of your old horse, wasn't it?" I nodded trying to hold back tears. He was gone and there was no way I would see him again. "Surely, he was being spoiled by a little ten-year old girl with carrots and grooming." I thought to myself as I watched Ace. I hopped off of the fence and took the grooming kit Julia handed me. "Hey, don't get to attached okay? We may find he isn't cut out for the lesson program." Julia smiled trying to soften her words. I nodded and slowly made my way over to Ace. "Hey Ace, I'm gonna groom you today, alright?" He bobbed his head in response. Slowly but surely, I began currying his filthy coat. Under all this, he was really a pretty horse. After a thorough currying, I took the hard brush and began grooming his legs which were drenched in muck. Humming my favorite song as I worked, I noticed something black in the dirt. "Uh-oh. I hope you don't have any bugs of some sort." I said to him and started brushing a bit harder. I started noticing something white underneath. The harder I brushed, I realized the black stuff was some sort of ink or paint. A little white sock showed under the black. "Ace..." I whispered in awe, too choked up to move. "Ace of Spades," I said remembering his show name. He perked up and nuzzled me a little bit. Tears flooded my eyes. "It's you! Ace, it's really you!" I exclaimed throwing my arms around his neck and burying my face in his sleek, now clean mane. "Julia!" I called still sobbing like a baby. She came running out. "What's wrong?" "It's Ace. My old horse, Ace." I whispered. She looked at him. "How do you know, Ashely? It could be any black horse." He has a sock that was painted over... and..." I choked on my words, "he acts just like him. I know it's him, there's no doubt." Julia just stared at me smiling. "Well, there's only one way to really find out. Go for a ride!" I grinned, tears running down my face. I had my horse back and nothing else mattered. "Why on earth would he be in a rescue?" I asked a few hours later. I was sitting in a chair in the office of the barn. I had just finished riding and taking care of Ace. Julia was barely able to pull me away so we could figure everything out. "I'm really not sure. I think I'll give that lady from Silver Creek Rescue Center a call," Julia answered picking up the phone. I sat on pins and needles as Julia spoke. I was standing in Ace's new stall when Julia came from the office looking grim. "What's wrong?" I asked letting myself out of the stall. "The young girl you sold him to, her father lost his job a couple months ago. They were forced to sell Ace. They sent him to live in a nearby stable which they had no idea abused their horses. "Was the name of the barn they sold him to Oakwood Farm?" I asked dread sweeping through me. "Yes. The owners said you used to board Ace there a couple years ago. Once they found out, we're assuming that was the reason they painted over his sock. About a week ago, Silver Creek found him and took him in. I said I would care for him if I got a discounted price and I'm so glad I did." Julia finished. Ripples of anger rushed through me. "How dare they hurt him!" I cried. "It's over now. But why don't we give your Mom a call and work things out for you to board him here for working instead of lessons--working student?" Julia said smiling. This a great story! I think you should write other stories and maybe even write more on this one. I like it! I like this story! It sorta relates to War Horse Joey. And the horse's name is cool! Annie, that story is AMAZING! How do you do it? You have to write more. And I totally agree with Adie, you have to answer those questions! Can you please write more? It's awesome! I found the time to write chapter five! Enjoy! I will write more, don't worry. I was gonna stop here until I saw your comment and I didn't have the heart to stop. It may be a few days but I promise I will post another chapter. Would you guys like me to make this into a series? I'm enjoying writing so much! Annie, you have to write more! Why was his white sock painted over? How did he get into the rescue? Who owned him before? Please, please, PLEASE write more! Amazing story! Please write more! Thank you! First time writing in 1st person!